This NEW product is perfect for all sausage products were cheese is added. 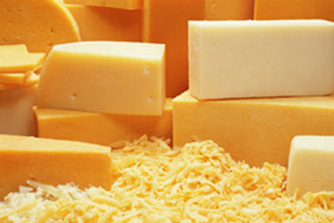 High temperature cheese is specially made so that it will not melt when cooked under normal smokehouse temperatures. Used at 5% to 10% level, High Temp Cheese gives a creamy flavor to your sausage products. The 1/4" dice is a perfect size for all types of sausages from big bologna to snack sticks. This product comes packed in 1 lb., 5 lb., and 10 lb. bags. We have the following types available: Mild Cheddar, Pepper Jack, Mozzarella, Blue, Swiss, Lava Jack, Ghost Pepper, Sriracha, and Louisiana Hot. **If you are located West of the Mississippi River, or reside in Mississippi, Western Alabama, the New England Area, or in Florida, there is a chance your order will be shipped out the following Monday. Please call us if you have questions or concerns. 800-521-3188.